Married Name 3 June 1961 As of 3 June 1961,her married name was Meister. Luena Repka was the daughter of Richard Repka and Theresa Reinecke. 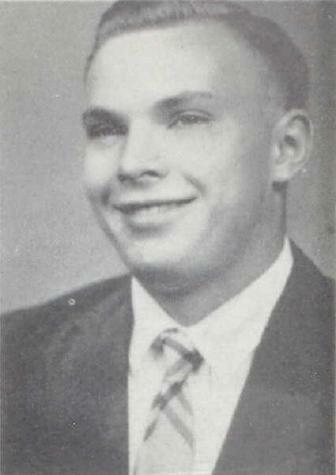 Luena Repka married Donald Meister, son of Joseph Meister and Elizabeth M. Gruber, on 3 June 1961. Name Variation Terry Meister was also known as Jake. Terry Meister was born on 4 June 1959 at Sauk, Wisconsin. He was the son of Martin J. Meister. Terry Meister died on 20 September 2012 at age 53 Terry “Jake” Meister, age 53, of Reedsburg, passed on Thursday, September 20, 2012, surrounded by his family following a long and courageous battle with cancer. He was born on June 4, 1959 in Reedsburg, the son of Martin “Bud” and Phyllis (Stowell) Meister. He was united in marriage on October 28, 1988 to Lynette Lennon. Terry was the hardest working man his family had ever known. He played hard and was and outdoors man who enjoyed hunting, fishing, training his dogs, cutting wood and making maple syrup. He enjoyed playing softball in his early days. Terry was a good family man. He loved his family and was always there for his kids sporting events. He was a very caring, loving and thoughtful man. Terry was a great and loving son, husband, father, grandfather, brother, uncle and friend. He was a wonderful influence to every life he touched. Along with many Nieces, Nephews, Aunts, Uncles, Cousins and Friends. A Mass of Christian Burial will be conducted at 12 Noon on Saturday, September 29, 2012 at Sacred Heart Catholic Church, Reedsburg, with Father Thomas Monaghan officiating. Visitation will be held on Saturday from 10:30 until 12 Noon at the church. The family requests memorials of remembrance on behalf of Terry's request to be made to the Reedsburg Area Medical Center. The Farber Funeral Home is assisting the family with the arrangements. Married Name 2 August 1931 As of 2 August 1931,her married name was Horstmann. Anna Ribbke was born on 14 February 1914 at LaValle, Sauk, Wisconsin. Anna Ribbke married Henry W. Horstmann, son of Augustus Horstmann and Emma Rathjen, on 2 August 1931. 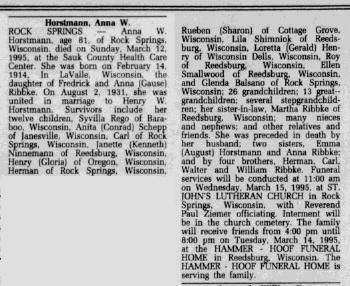 Anna Ribbke died in March 1995 at Sauk, Wisconsin, at age 81 Anna (Ribbke) Horstmann obituary. Carl H. Horstmann was born on 1 December 1934 at Minnesota. He was the son of Henry W. Horstmann and Anna Ribbke. Carl H. Horstmann died on 23 November 2013 at Sauk, Wisconsin, at age 78 Carl H. Horstmann, age 78 of Rock Springs, passed away on Saturday, November 23, 2013 at the Reedsburg Area Senior Life Center. He was born on December 1, 1934 in Cottonwood Co., MN the son of Henry and Anna (Ribbke) Horstmann. He proudly served his country in the U.S. Army. He worked at Badger Ordinance in Baraboo prior to his retirement. Carl enjoyed flea markets, playing cards, activities with the residents at the Senior Life Center and playing cherry machines. He was preceded in death by his parents, a sister, Anita (Conrad) Schepp, a nephew, Bruce Rego, a niece, Janean Schepp and two brother-in-laws; Conrad Schepp and Patrick Rego. The family would like to thank Tami and the staff at the Reedsburg Senior Life Center for all their care given to Carl. We honor his life with a funeral service being conducted on Friday, November 29, 2013 at 11:00 A.M. in the Farber Funeral Home. Visitation will be on Friday from 10:00 A.M. until the time of service at the funeral home. Burial will be made at St. John Lutheran Cemetery, Rock Springs. 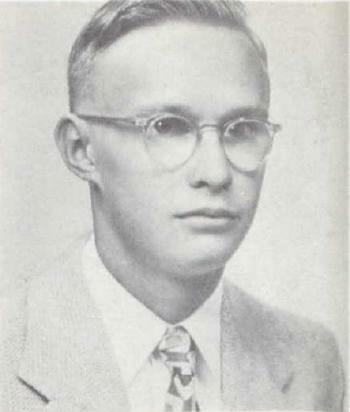 Carl H. Horstmann graduated in 1954 at Reedsburg High School, Reedsburg, Sauk, Wisconsin. Married Name 2 May 1953 As of 2 May 1953,her married name was Schepp. Anita V. Horstmann was born on 4 March 1933 at Loganville, Sauk, Wisconsin. She was the daughter of Henry W. Horstmann and Anna Ribbke. Anita V. Horstmann married Conrad D. Schepp on 2 May 1953. 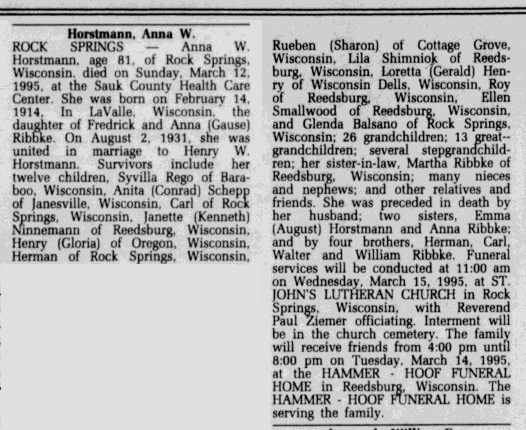 Anita V. Horstmann died on 17 February 2011 at Wisconsin at age 77. 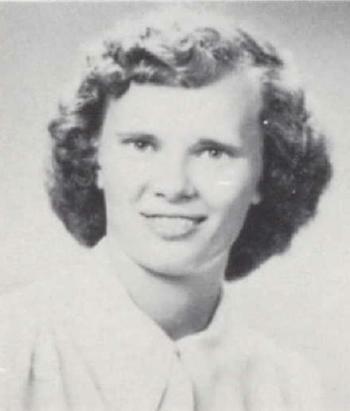 Anita V. Horstmann graduated in 1951 at Reedsburg High School, Reedsburg, Sauk, Wisconsin. Conrad D. Schepp was born in 1931. He married Anita V. Horstmann, daughter of Henry W. Horstmann and Anna Ribbke, on 2 May 1953. Conrad D. Schepp died in 2011. Syvilla Horstmann married Patrick Rego. Syvilla Horstmann was born circa 1932 at Wisconsin. Patrick Rego married Syvilla Horstmann, daughter of Henry W. Horstmann and Anna Ribbke. Patrick Rego died before November 2013. Kenneth Henry Ninnemann was born on 24 May 1920. He died on 29 October 2000 at age 80. Married Name Her married name was Shimniok. Lila Horstmann married (?) Shimniok. Lila Horstmann was born circa 1944. 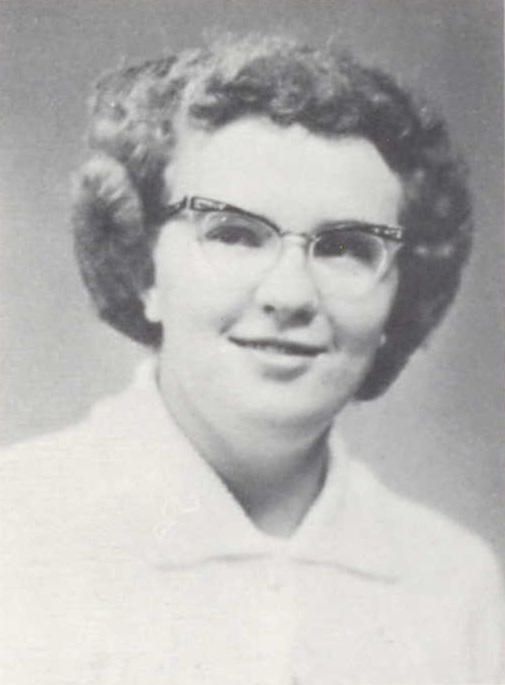 Lila Horstmann graduated in 1962 at Webb High School, Reedsburg, Sauk, Wisconsin. (?) Shimniok married Lila Horstmann, daughter of Henry W. Horstmann and Anna Ribbke. Loretta Horstmann was the daughter of Henry W. Horstmann and Anna Ribbke. Loretta Horstmann married Gerald Henry. Gerald Henry married Loretta Horstmann, daughter of Henry W. Horstmann and Anna Ribbke. Married Name Her married name was Smallwood. Ellen Horstmann was the daughter of Henry W. Horstmann and Anna Ribbke. Ellen Horstmann married (?) Smallwood. (?) Smallwood married Ellen Horstmann, daughter of Henry W. Horstmann and Anna Ribbke. Married Name Her married name was Balsano. Glenda Horstmann was the daughter of Henry W. Horstmann and Anna Ribbke. Glenda Horstmann married (?) Balsano. Name Variation Henry Horstmann was also known as Horstman. Henry Horstmann married Gloria (?). Henry Horstmann was born circa 1939 at Wisconsin. Henry Horstmann graduated in 1956 at Reedsburg High School, Reedsburg, Sauk, Wisconsin. Gloria (?) married Henry Horstmann, son of Henry W. Horstmann and Anna Ribbke. Herman August Horstmann was born on 18 November 1939 at Westfield, Sauk, Wisconsin. Herman August Horstmann died on 14 November 2015 at age 75 Herman August Horstmann, 75, of Rock Springs, passed away Saturday, Nov. 14, 2015, at his residence. Herman was born Nov. 18, 1939, in Westfield Township, to the late Henry and Anna (Ribbke) Horstmann. He attended local schools. Following graduation from Webb High School, he served in the U.S. Marine Corp.
Herman was a line inspector for Wisconsin Power and Light for many years. He was also a member of the Rock Springs Volunteer Fire Department for 28 years, and volunteered at Rock Springs Cemetery, serving on the board. Survivors include his brothers and sisters, Syvilla Rego, Janette Ninnemann, Lila Shimniok, Loretta (Gerald) Henry, Ellen Smallwood, Glenda Horstmann, Henry (Gloria) Horstmann, Reuben (Sharon) Horstmann; and many nieces and nephews. In addition to his parents, he was preceded in death by his brothers, Carl H. and Roy E. Horstmann; his sister, Anita (Conrad) Schepp; nephew, Bruce Rego; niece, Janean Schepp; and three brothers-in-law, Conrad Schepp, Patrick Rego, and Kenneth Ninnemann. Funeral services for Herman will be at 11 a.m. Thursday, Nov. 19, 2015, at Farber Funeral Home in Reedsburg. A time of visitation will be held from 9:30 a.m. until the time of service on Thursday at the funeral home. Burial will follow services with military rites at St John Cemetery in Rock Springs. Herman August Horstmann graduated in 1958 at Webb High School, Reedsburg, Sauk, Wisconsin. Roy E. Horstmann was born on 22 September 1948. Roy E. Horstmann died on 20 March 2015 at age 66 Roy Horstmann, of Reedsburg, passed away at the age of 66 years 6 months and 18 days on Friday, March 20, 2015. Roy was born September 22, 1948, at his home in Rock Springs to Henry and Anna (Ribbke) Horstmann. He graduated from Reedsburg Webb High School in 1967. Roy was employed by Badger Ordinance, Rock Springs Co-Op, and most recently for Lakeside Foods in Reedsburg. He was an avid fisherman, loved bowling and roller skating, running the roller rink in Rock Springs for several years. He was also a volunteer fireman, and first responder for Rock Springs. Joseph F. Duren was born on 20 April 1926 at Wisconsin. He was the son of Jacob W. Duren and Clara M. Bodendein. Joseph F. Duren married Laverne Vlasak on 17 August 1948. Joseph F. Duren died on 23 November 2013 at Sauk, Wisconsin, at age 87 Joseph F. Duren, age 87 of Cazenovia passed away on Saturday, November 23, 2013 at the Sauk Co. Health Care Center, Reedsburg. He was born on April 20, 1926 in Westford Township, Richland Co. WI the son of Jake and Clara (Bodendein) Duren. He proudly served his country during WWII in the Navy having served at Pearl Harbor, Saipan, Nagasaki, and Hiroshima within two weeks after the atomic bomb. He returned home and was married to Laverne Vlasak on August 17, 1948 at St. Anthony’s Catholic Church, Cazenovia. This marriage was blessed with six children. Joseph was a proud farmer, did custom round baling and enjoyed his John Deere tractor. He went on many deer hunting trips with his family to the cabin at Hayward. Spending time with his family, especially his grandchildren provided great joy in his life and he loved them all. He was preceded in death by his parents, his wife Laverne, brothers; Donald, Dean and Raymond; Sister, Janice Braun. We honor his life with a funeral service on Wednesday, November 27, 2013 at 11:00 A.M. in the Cazenovia Chapel with Fr. Lorin Bowens officiating. Visitation will be held on Tuesday, November 26th from 3-7 P.M. at the Cazenovia Chapel. A Rosary Prayer service will be prayed at 6:30 P.M. Burial will be made in the Czech National Cemetery with military graveside rites being conducted by the Cazenovia American Legion Post 491. The Farber Funeral Home is assisting the family with the arrangements. Married Name 17 August 1948 As of 17 August 1948,her married name was Duren. Laverne Vlasak married Joseph F. Duren, son of Jacob W. Duren and Clara M. Bodendein, on 17 August 1948. Laverne Vlasak died before November 2013. Dean Duren was the son of Jacob W. Duren and Clara M. Bodendein. Dean Duren died before November 2013. David Duren was born on 16 October 1950 at Reedsburg, Sauk, Wisconsin. He was the son of Joseph F. Duren and Laverne Vlasak. David Duren died on 21 January 2016 at age 65 David D. Duren, 65 of LaValle, passed away Thursday, January 21, 2016, at his residence. David was born October 16, 1950 in Reedsburg, to the late Joseph F. and Laverne (Vlasak) Duren. He was employed in commercial construction as an excavator, running water and sewer. David loved his yellow labs, and always had a soft spot for local stray animals. Survivors include his son Bradley Brandt and Angi Fry with her children Nic and Jaden, of Baraboo. His grandchildren; Dawson Brandt, Alexis Winecke, and Autumn Winecke. Ken (Beverly) Duren of Ironton. And many nieces, nephews, and other family and friends. Funeral services for David will be held on Monday, January 25, 2016, at 11:30 am at Farber Funeral Home in Reedsburg. Visitation will also be on Monday, at the funeral home from 9:30 am. Burial will follow services Champion Valley (Czech National) Cemetery. George E. Grunke married Leona D. Schuette, daughter of August Wilhelm Schuette and Ida Caroline Krause, on 12 October 1940. George E. Grunke died on 8 May 1979. Elmer Kautzer married Elnora Green. Married Name Her married name was Kautzer. Elnora Green married Elmer Kautzer. Clifford Schulz married Edna M. Nachreiner, daughter of Herman Harry Nachreiner and Olive Rowena Ward, on 13 December 1936. Clifford Schulz died in January 1981. David Schulz was the son of Clifford Schulz and Edna M. Nachreiner. David Schulz died before December 2012.